Now, this was a fine gathering of animal lovers! Over 80,000 pet lover and about 8,000 dogs took over the streets in the historic Soulard neighborhood of St Louis, Missouri on Sunday, February 27. 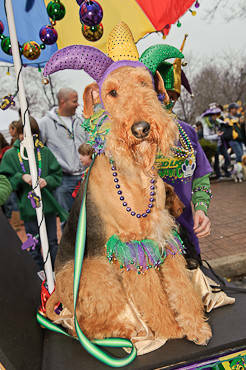 Dressed in their Mardi Gras best, they came out for the 18th annual Beggin Pet Parade. Called the largest pet parade in America, this year the Beggin Pet Parade raised money to benefit the Open Door Animal Sanctuary, a no kill shelter dedicated to finding homes for homeless dogs and cats. St Louis Rams offensive lineman, Jason Brown and his dog, Bear, served as grand marshals for the parage. Before the parade began they took part in a world records attempt for the Guinness Book of World Records. Dogs gathered in Soulard tried to break the world record for a group bark. They managed a 110 decibel bark. Unfortunately, the world record is 124 decibels. Following the parade was the annual weiner dog race. This was all part of the Soulard Mardi Gras celebration. Events continue this month.